General Lee was offered the position of the head of the Union army by Abraham Lincoln, but decided to lead the Confederate army instead as he couldn’t bring himself to lead troops against his native Virginia. Despite the Confederates being vastly outnumbered and not as well equipped as the North, Lee and his right hand man, Stonewall Jackson, managed to post victory after victory against the North, primarily due to Lee’s brilliance, Jackson’s audacity, and the North’s moronic Generals. The Union generals weren’t morons, they were conflicted. Many were States Right’s advocates, some were ex-slaveowners or related to slaveowners, many wanted to let the Confederacy leave the Union. The Confederate generals were not as conflicted, fighting for their states, and what they viewed as their right to own humans. So the Union generals for fighting for a principal that not all of them had sympathy for, whereas the Confederate generals were fighting for themselves. In the end Lincoln found Grant, a brilliant general who also opposed treason and slavery. I am a southerner and a states rights advocate, and I agree Lee, Jackson, Stuart, etc. were absolutely brilliant. The South was certainly out gunned, but to call the northern generals morons is unfair. Grant was an excellent general. But Lee’s excuse for refusing the offer from his Commander in Chief Pres. Lincoln does not ring true. It is one thing to resign so as not to have to fight against your fellow Virginians, it is quite another then to accept the commission to lead the charge to destroy the nation you had sworn to protect. Lee should have refused a commission from the Confederacy more vehemently than he did from the Union if he had any scruples. He was a great military leader, no doubt, and he served as a great leader of the University that now bears his name, but he should no more be honored as a military hero anywhere in the United States any more than we honor Benedict Arnold. Had Lee simply retired from the military, then all the bloodshed could have been averted–the “idiot generals” did ultimately defeat the South, but if Lee had not been at the helm it would have all happened in short order. 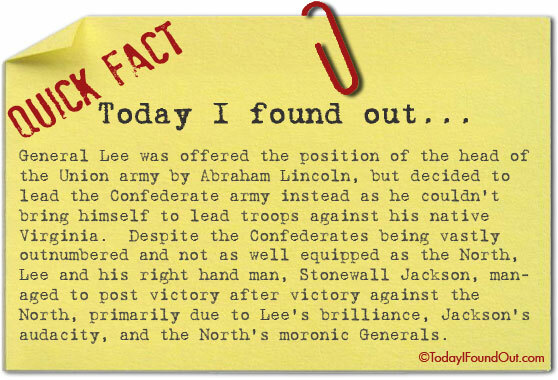 The Northern generals were not so much idiots as Lee was brilliant. And that brilliance belonged first and foremost to the Union–If not for the Union, his military prowess should not have been used at all. He didn’t think he was destroying the nation, he thought he was fighting for it..against an overreaching central government….that sound familiar? Whatever,,and I suppose u also don’t realize that Lincoln’s first reaction was to re unite the union, he could have cared less about the slaves. Because after all they were considered inferior human beings . In fact he was known to have said I wish I round them all up and ship them back to Africa. There enough said, u people never want to look at all of history in its true context.remember this country was built on atrocities . At least the blacks were put through genocide like the Indians, at the order of the us army after the civil war. U people always want to fixate on one issue and make it the worst thing ever. History is not a pretty picture, that’s why it’s history for us to learn from and be reminded. Of. Thus the Confederate monuments should stay as a reminder. Larry, you are obviously conflicted in regard to Lee. Read more. The Civil War didnt start out about slavery. It started because Northern textile mills were being outpriced by British and Irish textile mills buying the cheap US cotton by the ship load and competing against American exports. Robert E Lee, 1st in his gradiuating class at Westpoint, was Lincoln’s first choice to lead the Federal troops but Lee was too righteous to lead Federal troops against civilians in Virginoa running the cotton embargo shipping blockades. They werent a warring Nation he told Limcoln. It was about States Rights over Federal mandates. Lincoln never even mentioned slavery in his Gettysburg Address. The sole purpose of the Emancipation Proclamation was to free slaves that would have to move North to stay alive and finally break the economic backbone of the cotton industry in the South. It was a noble gesture for sure but hourly laborers still to thos day do not make a living wage so slavery never really ended, it just took on a new face.